If you do not preserve the Orthodox faith and the commandments of God, the least you can do is not to humiliate your hearts by inventing false excuses for your sins! If you do not honor our customs, the least you can do is not to laugh at things you do not know or understand. If you do not accept the motherly care of the Holy Orthodox Church, the least you can do is to confess you act wrongly, that you are sinning against the Church and behave like children! If you do, the Orthodox Church may forgive you, like a loving mother, your coldness and slights, and will receive you back into her embrace, as if you were erring children. 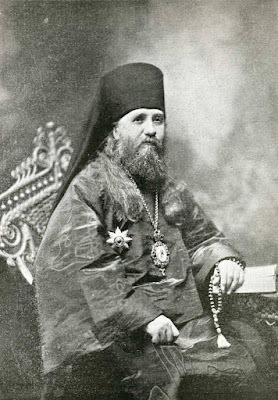 Holding to the Orthodox faith, as to something holy, loving it with all their hearts and prizing it above all, Orthodox people ought, moreover, to endeavor to spread it amongst people of other creeds. Christ the Savior has said that “neither do men light a candle and put it under a bushel, but on a candle stick, and it giveth light unto all that are in the house.” (Matthew 5:15) The light of Orthodoxy was not lit to shine only on a small number of men. The Orthodox Church is universal; it remembers the words of its Founder: “Go ye into the world, and preach the gospel to every creature” (Luke 16:15), “go ye therefore and teach all nations.” (Matthew 28, 19) We ought to share our spiritual wealth, our truth, light and joy with others, who are deprived of these blessings, but often are seeking them and thirsting for them. Once “a vision appeared to Paul in the night, there stood a man from Macedonia and prayed him, saying, come over into Macedonia, and help us,” (Acts 16:9) after which the apostle started for this country to preach Christ. We also hear a similar inviting voice. We live surrounded by people of alien creeds; in the sea of other religions, our Church is a small island of salvation, towards which swim some of the people, plunged in the sea of life. “Come, hurry, help,” we sometimes hear from the heathen of far Alaska, and oftener from those who are our brothers in blood and once were our brothers in faith also, the Uniates. “Receive us into your community, give us one of your good pastors, send us a Priest that we might have the Divine Service performed for us of a holy day, help us to build a church, to start a school for our children, so that they do not lose in America their faith and nationality,” those are the wails we often hear, especially of late. But who is to work for the spread of the Orthodox faith, for the increase of the children of the Orthodox Church? Pastors and missionaries, you answer. You are right; but are they to be alone? St. Paul wisely compares the Church of Christ to a body, and the life of a body is shared by all the members. So it ought to be in the life of the Church also. “The whole body fitly joined together and compacted by that which every joint supplieth, according to the effectual working in the measure of every part, maketh increase of the body unto the edifying of itself in love.” (Ephesians 4:16) At the beginning, not only pastors alone suffered for the faith of Christ, but lay people also, men, women and even children. Heresies were fought against by lay people as well. Likewise, the spread of Christ’s faith ought to be near and precious to the heart of every Christian. In this work every member of the Church ought to take a lively and heart-felt interest. This interest may show itself in personal preaching of the Gospel of Christ. And to our great joy, we know of such examples amongst our lay brethren. In Sitka, members of the Indian brotherhood do missionary work amongst other inhabitants of their villages. And one zealous brother took a trip to a distant village (Kilisno), and helped the local Priest very much in shielding the simple and credulous children of the Orthodox Church against alien influences, by his own explanations and persuasions. Moreover, in many places of the United States, those who have left Uniatism to join Orthodoxy point out to their friends where the truth is to be found, and dispose them to enter the Orthodox Church. Needless to say, it is not everybody among us who has the opportunity or the faculty to preach the gospel personally. And in view of this I shall indicate to you, brethren, what every man can do for the spread of Orthodoxy and what he ought to do. The Apostolic Epistles often disclose the fact, that when the Apostles went to distant places to preach, the faithful often helped them with their prayers and their offerings. Saint Paul sought this help of the Christians especially. Consequently we can express the interests we take in the cause of the Gospel in praying to the Lord, that He should take this holy cause under His protection, that He should give its servants the strength to do their work worthily, that He should help them to conquer difficulties and dangers, which are part of the work, that He should not allow them to grow depressed or weaken in their zeal; that He should open the hearts of the unbelieving for the hearing and acceptance of the Gospel of Christ, “that He should impart to them the word of truth, that He should unite them to the Holy Catholic and Apostolic Church; that He should confirm, increase and pacify His Church, keeping it forever invincible”, we pray for all this, but mostly with lips and but seldom with the heart. Don’t we often hear such remarks as these: “What is the use of these special prayers for the newly initiated? They do not exist in our time, except, perhaps, in the out of the way places of America and Asia; let them pray for such where there are any; as to our country such prayers only needlessly prolong the service which is not short by any means, as it is.” Woe to our lack of wisdom! Woe to our carelessness and idleness! Orthodox people, in celebrating the day of Orthodoxy, you must devote yourselves to the Orthodox faith not in word or tongue only, but in deed and in truth.